Firstly, let me wish you a very happy New Year! I hope 2018 brings you much health, happiness and joy! When I write these articles, I like to offer some practical and, hopefully, insightful slices of information to help the trading journey go all that much smoother. Today, after an eventful first trading week in the financial markets, I wanted to share some insights on using The Commitment of Traders Report for our long-term speculation. The COT (Commitment of Traders) report, while directly linked to the futures market, can still be used as a highly useful resource for Forex trading as well. This is especially true for those currency traders among us who like to engage in regular trading activity on the likes of the major pairs like EURUSD, GBPUSD and AUDUSD. In fact, COT can be used for any of the Major Dollar-based FX pairs and even the Dollar Index itself, as these pairs are all available to trade as liquid futures contracts which directly mirror their spot market counterparts, while the Dollar Index futures which trade on the Intercontinental Exchange (ICE) parallels the cash Dollar Index. Unfortunately, we do have to exclude cross-pairs like the GBPCAD or EURJPY; these pairs do have futures contracts, but they are highly illiquid and therefore are not ideal to actively trade. The Commitment of Traders Report is a report released by the Commodity Futures Trading Commission (CFTC) every Friday at 3:30 Eastern Time. The report reflects the commitments of traders on the prior Tuesday. The weekly report details trader positions in most of the futures contract markets in the United States. Data for the report is required by the CFTC from traders in markets that have 20 or more traders holding positions large enough to meet the reporting level established by the CFTC for each of those markets. This data is gathered from schedules electronically submitted each week to the CFTC by market participants listing their position in any market for which they meet the reporting criteria. As we would expect, the largest positions are held by commercial traders that actually provide a commodity or instrument to the market, or have bought a contract to take delivery of it. Thus, as a general rule, more than half the open interest in most of these markets is held by commercial traders. Speculators are market participants that are not able to deliver on a contract or that have no need for the underlying commodity or instrument. They are buying or selling only to speculate that they will exit their position at a profit, and plan to close their “seller” or “buyer” position before the contract becomes due. In most of these markets, the majority of the open interest in these speculator positions is held by non-commercial traders whose positions are large enough to meet reporting requirements. The remaining contract holders are referred to by the CFTC as non-reportable. This is because they don’t meet the position size that requires reporting to the CFTC, thus making them the small speculators. The non-reportable open interest in a futures market is determined by subtracting the open interest of the commercial traders plus non-commercial traders from the total open interest in that market. As a rule, the aggregate of all traders’ positions reported to the CFTC represents 70 to 90 percent of the total open interest in any given market. In the above monthly chart, we can see there has been a steady downtrend for 4 years with open interest as the magenta line, rising as the trend got stronger, then it dipped a little (my red line) as the trend ran out of steam, only to then pick up again as more people entered the market for the more recent uptrend (my blue line). The bottom graph shows the public in red, the commercial hedgers in blue (who typically hold positions in the opposite direction of the trend) and the large institutions in green. If the lines are above zero they are net long and below means net short. This is a great study of where the “money” is in the market, albeit lagging. While it should be noted in advance that the COT report is lagging in nature, it does offer the disciplined trader an insight into the behavior of the key market speculator groups and can be used as a complimentary analytical tool for the longer term position trader and swing trader alike. 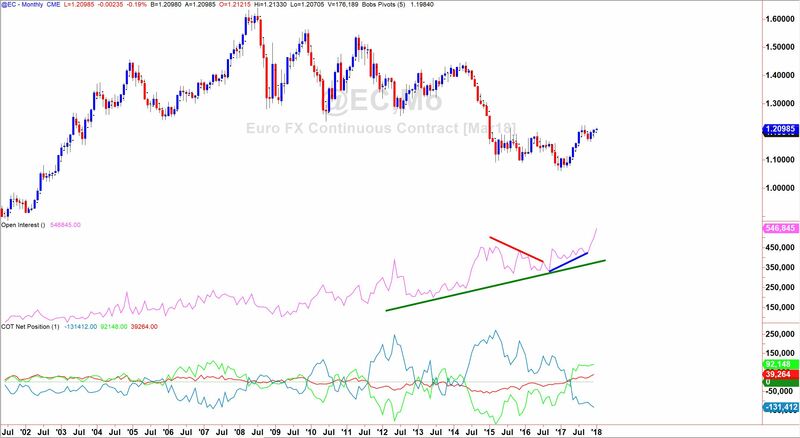 While the data may be generated from futures market activity, it can easily be used as a reflection of what to expect in the Spot FX arena too, as both markets trade in line with one another. Remember that technical analysis is more of an art than a science, especially when we incorporate the use of indicators like the COT; but if they are used in a disciplined manner alongside a solid and detailed trade plan, they can become a useful tool in the competent market speculator’s tool bag. I hope you found this useful.